This week’s web special offers the last of the Irish Heather bundles. In August, I introduced the grand bundle with colors extracted from a photograph of the Irish hillside taken by Nancy Fallone. Once a month for five months we have offered nine of those fabrics as a web special. My blog of August 22nd also showed a Thousand Pyramids quilt made with all 45 of the fabrics. 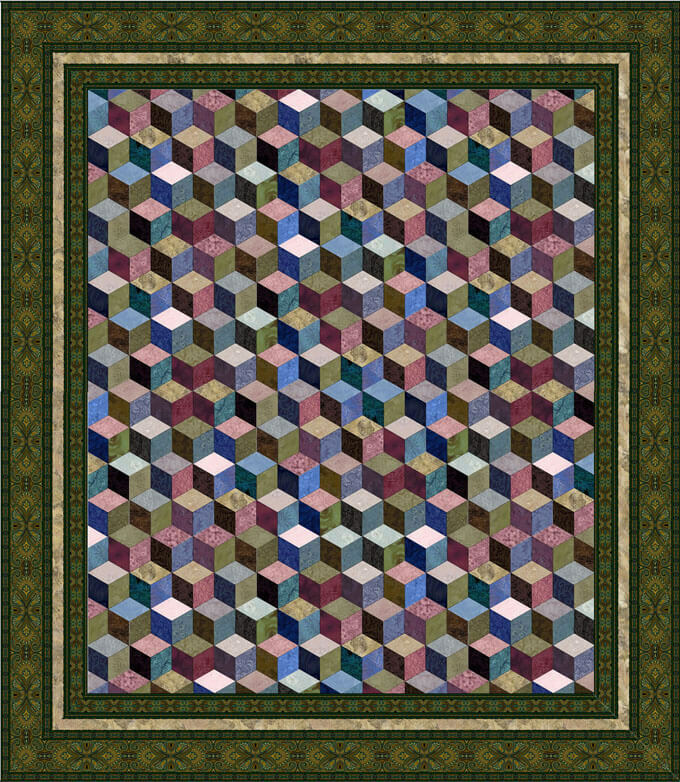 I love scrappy quilts and as we wind up the Irish Heather grand bundle web specials, I want to share another of my favorite “scrappy” patterns made with a 60 degree diamond. There are more than 20 different names for this design including Baby Blocks, Tumbling Blocks and Diamond Cube. My pattern, ”Scrappy Blocks,” illustrates yet another name for this design. Just as in Thousand Pyramids, this quilt is also made in block units. Within the unit try to get a balance of all the colors, the darks, lights and accents. Here is a sampling of possible blocks. The pattern, Scrappy Blocks, has instructions for a crib-sized quilt, but to make the quilt larger just make more blocks until you have the width and length that you like. You would still use the same edge pieces that are used in the crib sized quilt, just more of them, depending on how many blocks you make for your quilt. I love using border print fabrics to finish off a quilt. My border print fabrics all have both a narrow and a wide border as shown below. Sometimes there is just a solid color in the seam allowance areas and sometimes a pattern as seen in the second example. Typically, I add the narrow border, a “middle” border of a different fabric and then the wide border as I did in the two quilts shown above. When making a smaller quilt, a border like the one shown above would be too wide and could overwhelm the interior design. Therefore it is necessary to try some other options. So in the next example, shown below, the Delhi border was used, but instead of using the narrow and wide stripe with a contrasting fabric in between, I used the portion of the border shown below, which has the wide stripe, plus the seam allowance area and a portion of the edge of the narrower stripe. I found this border still a little overwhelming for the small quilt, but that same border used on the larger quilt has better proportions. I tried another variation of the Delhi border on the smaller quilt this time using the portion of the border shown here. Here is yet another border on the Scrappy Blocks quilt. Compare all the quilts shown here and notice how the overall colors of the quilt look different depending on which color border is used. If you have collected at least quarter yard sets of each of the Irish Heather bundles you would have plenty of fabrics to make the crib or double size quilts shown here. Three yards of border print is a safe amount for a double size quilt. Two and a quarter yards would be enough for the small one.